What else was going on in Londinium? Use our great resource to learn more about Roman London. 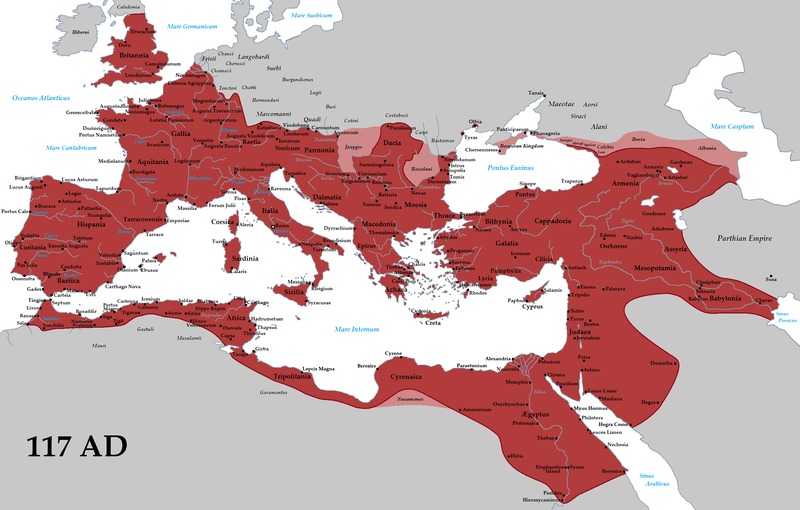 The red area indicates the extent of the Roman Empire in the early second century CE, while pink areas indicate Roman client states. Dots are where remains of dromedary or Bactrian camels have been identified. 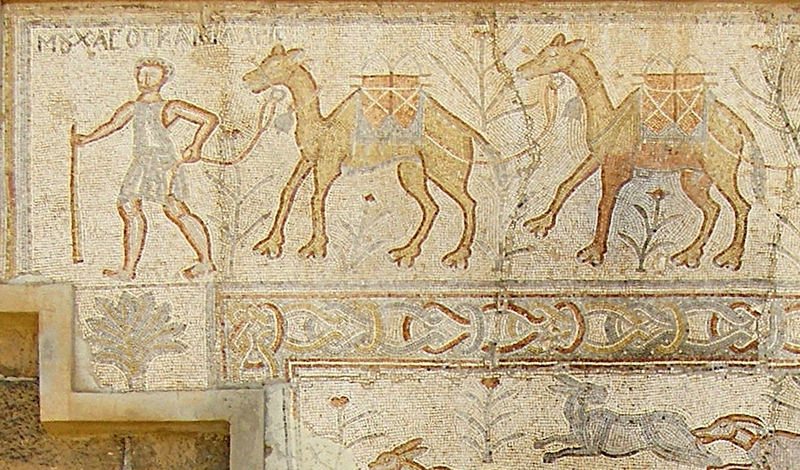 This sweet second-century mosaic from Bosra, Syria, depicts a camel train, or caravan. Bosra was the capital of the Roman province of Arabia. Take a look at the map above, and compare it with this fantastic map of ancient Roman under Emperor Trajan, around 117. What are some Roman provinces or regions where archaeologists have identified remains of camels? Why is the discovery of camels unusual in these areas? Camels were nowhere near indigenous in these regions. They had to be deliberately imported. Dromedary camels, also called Arabian camels, have a wide species range, extending throughout Northern Africa, the Arabian Peninsula, and Central Asia. Dromedaries have a single hump and are not endangered. Bactrian camels have a narrow species range, in the Gobi desert of China and Mongolia. Bactrians have two humps, and are critically endangered. How did ancient Romans get their hands (and their goods) on these exotic animals? Ancient Rome was an incredibly cosmopolitan society, with political and social influence extending well beyond its home in the Mediterranean basin. Roman trading networks reached sub-Saharan Africa, India, and even Southeast Asia and China. Dromedary camels would have been very familiar to ancient Romans through extensive contact with provinces and nearby kingdoms in North Africa and Western Arabia. At the time of the Roman Empire, the Silk Road was already well-established. Silk Road trade allowed peoples of ancient Rome to be at least somewhat familiar with both raw materials and finished goods from places outside the Roman Empire itself—goods such as spices, silks, and exotic animals. Bactrian camels would have to have been imported from outside the empire, through traders and merchants on the Silk Road. How might the Romans have used camels throughout their far-flung empire? Read the terrific blog post from Caitlin Green for some help. 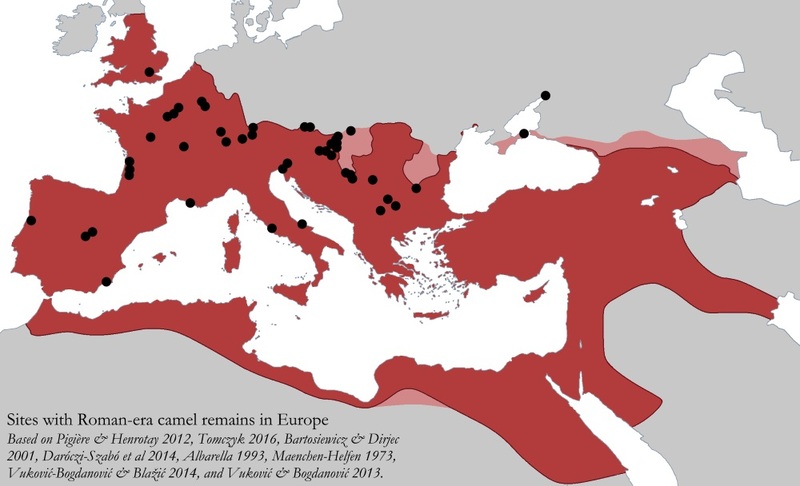 Most historians and archaeologists think camels “were being primarily used as pack animals/beasts of burden for both Roman military and civilian traffic.” Almost all camel finds have been located near major Roman roads, lending evidence to this theory. What other animals were used as pack animals during this time? Examples might include horses, oxen, and mules. Some camels may have been luxury pets of wealthy landowners or zookeepers. What other “exotic” animals did wealthy Romans keep as pets? Examples might include birds such as parrots and peacocks, rhinoceroses, and giraffes. What other meats did ancient Romans eat? Examples might include fish, pork, and doormice. Yes, doormice. Some historians have suggested that some camels may have been used in public shows (like circuses). What other animals were frequently used in entertainment? Examples might include lions, tigers, and crocodiles. Are camels still used for hauling cargo over long distances? Yes!! Dromedary camels are entirely domesticated, and have been for nearly 2,000 years. (That’s right—there are no wild dromedaries, although there are some wild Bactrians.) “Although the role of the camel is diminishing with the advent of technology and modern means of transport, it is still an efficient mode of communication in remote and less-developed areas” throughout North Africa and Arabia. In fact, technology is still relying on these “ships of the desert”—check out Google’s camel-cam street view.